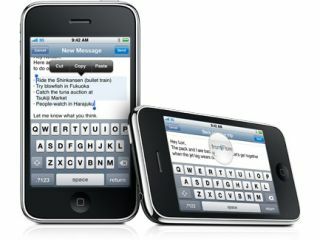 Orange has confirmed it will be offering the iPhone 3G and 3GS for sale from 10 November, with stores opening at 7am to cope with demand. The phone will be sold in Orange retail stores, online through the Orange portal, and through Phones4U, The Carphone Warehouse and Orange concession stands in HMV outlets. The iPhone will also be offered on pay as you go deals, with the 3G version costing £343, the 16GB 3GS coming in at £440 and the 32GB effort will cost you £539. The eagle-eyed among you will have noticed that these prices - give or take a few VAT-altered pence - are identical to O2's, showing that Apple still very much has a stranglehold on the pricing structure for its phone. The only slight difference is Orange has included a £30 per month deal for the iPhone on a two-year contract, although paying £225 for a phone and getting 150 minutes a month isn't going to attract a huge amount of interest. The move will mark the end of O2's exclusive deal with Apple to stock the iPhone in the UK, although the network will continue to carry the device on its network. If you're desperate to get an iPhone on Orange, you can pre-register at a dedicated mini-site, where you can see all the possible deals on offer (or you can just go on O2's website and work it out from there).